Custom jewelry is an option chosen by those who value uniqueness or want a particular design. 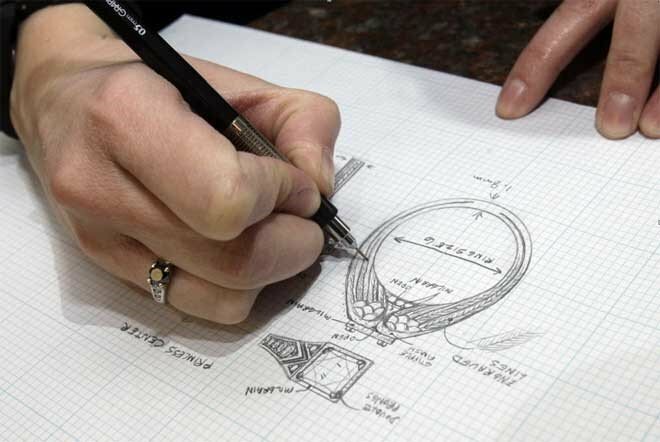 The process is both complex and simple for a skilled, talented jeweler who will be paired up with the customer. Making custom jewelry is therefore a mission that gives birth to a form of collective art, in which one partner comes with the emotion and the story of the pattern, and the other one brings its technical skills and own vision, creating a design like no other. What is the story behind custom jewelry? Making personalized jewelry involves advanced technology and detailed research. The process is long and arduous from the very first steps, when the client and the jeweler meet to discuss the idea, until the final stage. Every single jewel goes through specific stages until a final shape is outlined. The elements of a jewelry - stones, precious metal and/or ornaments - will go through a series of changes, requiring independent processing so that, in the end, all of them can be united in a final shape. Therefore, it is essential that both the client and the jeweler give enough time to the creation of each piece and realize how complex the work is and to possess the necessary skills to embody it. The first step in this process is the drawing. At this point, customer intervention is essential because he can now detail his wishes or change his mind. We recommend to carefully listen to the jeweler's advice and leave him space to express himself. The stage involves drawing, emotion and story, in a manner that has led to the birth of some of the most valuable objects in history. Keep in mind that making jewels is both art and science, creation and technique. The drawn concept is the beginning of the process and can not be skipped. It is, however, in a rather rough version. Once the sketch has been drawn, the next step is to create a wax mold, in which the jeweler will pour the material in the desired shape. At this moment, high-definition and state-of-the-art technology is used to make the model perfect and conform to the standards required during design creation. It is a crucial step in making custom jewelery and has a big influence on the final result. Material casting is also a complex process, requiring increased attention from the jeweler. Skills and experience will have the final say, because one wrong move can lead to disastrous results. The wax mold is placed in a steel container filled with powder, which is heated to a temperature of 550 degrees Celsius. The wax melts and solidifies the material around it, creating a second mold that will be used to cast the material and make the jewelry block. The liquefied precious metal is poured in it, and then cooled. 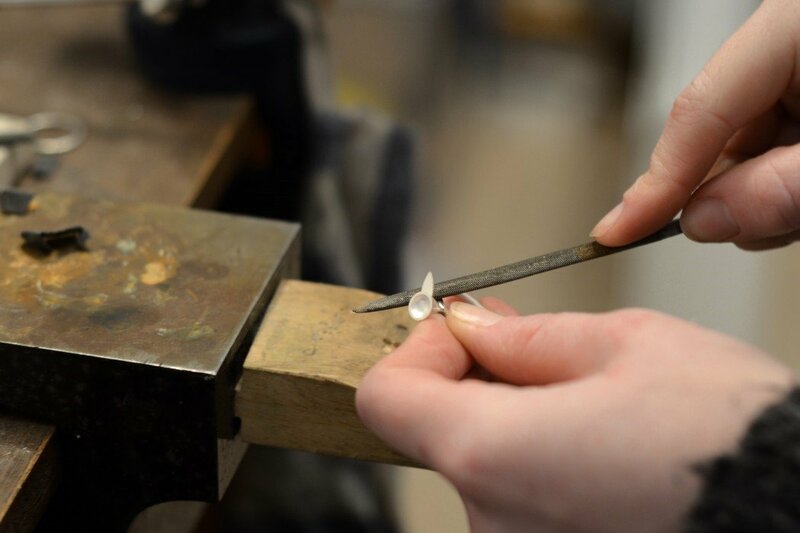 Although it seems a simple process, filing the precious jewelry requires special skills, special tools and a lot of patience. Now the jeweler removes the imperfections left after melting the material and polishes it. At this stage, he can create special ornaments or auxiliary patterns. The next step is grinding. Though a certain glow and smoothness was given to the jewelry in the previous stage, now is outlined the final shape of the material. The jeweler carefully works on every millimeter of the jewelry and grinds it to the highest degree of brightness and smoothness using very fine instruments. Then, the jewelry is carefully washed by hand or with an ultrasonic cleaner. Once the product has been polished, it is sent to the team responsible for its beauty. During this stage, the precious stones will be set in jewelry as soon as the beauty process ends. The stage requires tremendous patience, extreme precision and attention to detail. The final product has to be a great piece of art showing no imperfections. The precious metal processing does not end here. The finishing stage comes next, when a great refinement it is given. This it the final appearance that can be seen in the jewelry showcase. In some cases, as we have already mentioned in the guide “About gold and platinum jewelry” the pieces are plated with certain metals to enhance their qualities such as color or glow. For white gold, for example, rhodium is used. No product comes out of our hands without testing their quality. Jewelry is carefully checked to have zero imperfections. Each piece is given special attention by highly experienced jewelers, and those jewelry which have imperfections are sent back to the responsible departments. Therefore, no custom jewelery is just another piece. It requires hundreds of hours of work from our entire team, special skills and the use of high-performance equipment. However, the price of custom jewelry is affordable, therefore it would be advisable to consider such an option if, after long searches, you have not found what you want.